The fame of Hungary’s Tokaji wine region dwarves any of the country’s other fine wine appellations, and indeed most appellations in Europe. The historical sweet wines have been famed for centuries: there are records of the region producing aszú grapes (Botrytis-affected shrivelled grapes) from 1571, and it is as one of the world’s greatest sweet wine regions that Tokaji’s reputation has conquered the globe. In recent years, however, the production of dry table wines from the grapes of Tokaji has really taken off. It’s hard to say if this has been a conscious decision because sweet wines have proved harder to sell, or is simply a commercial move to supply wines that the world wants – crisp, dry whites – in a more reliable fashion, not subject to the vagaries of climate and the development of Botrytis. But it is certainly a discernable ‘movement’ with several samples of dry Tokaji landing on my tasting desk in the past few weeks. 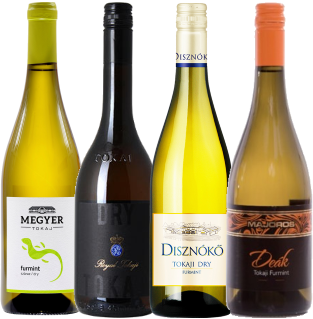 The main grape of dry Tokaji is also the main grape of its sweet cousin: Furmint. Grown on the volcanic soils, at some altitude, near the Carpathian Mountains in the east of Hungary, the thick-skinned Furmint grape tends to produce dry wines with a bit of phenolic bite, though winemaking can of course emphasise or play-down that aspect, and winemakers are adopting different techniques including barrel-fermentation and ageing, or long ageing on the lees, as a certain amount of experimentation continues. Most of these wines are pitched around the £10 mark on UK retailer shelves, and whilst differences are very apparent as you will see in my notes, I did find the quality level of the wines to be pretty even too: very good white wines of their style, though with nothing leaping out of the crowd at this stage in the progress of a new wine style for the world. I suppose the barrel-aged example from Arvay, at twice the price, points the way that some producers see – or hope to see – the style developing. (2016) A different wine from Royal Tokaji's 'Dry Furmint' or Vineyard Selection it appears, this blending Furmint with another Tokaji main grape, Hárslevelű. It is very dry, pithy, apple core and herby on the nose, the merest hint of something more peachy. On the palate the story is the same: crunchy apple and citrus just reveals an underlying layer of more unctuous stone fruits, but then the searing core of acidity pushes on. Sippable, fresh and seafood-friendly in a bone-dry style. (2016) From volcanic soils, there's a touch of honey to apple fruit, and it's a very nutty opening too, the wine fermented and aged in French oak barrels from Seguin Moreau. There's a lot of pear and apple fruit on the palate too, plenty of texture and richness, and it has a long and saline finish. Whether it distinguishes itself enough to be worth twice the price of other wines here is a moot point.